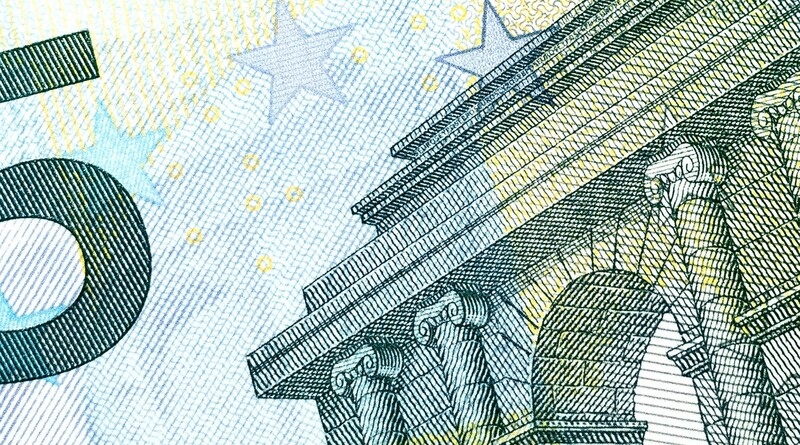 The more money we come across, the more problems we see. Not in this case though, Biggie. Photo by Didier Weemaels on Unsplash. We successfully completed the project, which took ten months from team inception to final delivery. It involved working with multidisciplinary teams from Customer Success to Operations. 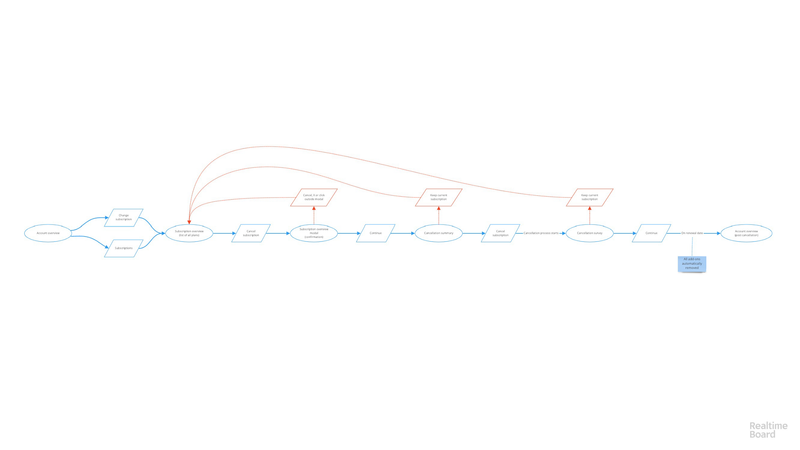 One of the highlights of the project was when we tackled updating the downgrade and cancellation flows. Migrating our payment processor from an internal function to a third-party platform allowed us to expand our services such as prorating accounts and automatic removal of add-ons. Add-ons are paid extra features which allow users to create custom domains for their landing pages, add more users to their account, etc. Prior to the migration, users had to manually remove add-ons when downgrading or cancelling plans. There were no breadcrumbs that led them back to the previous step. Users would get frustrated and usually ended up calling Customer Success to complete the process. That didn’t leave a good impression especially with customers who were churning. 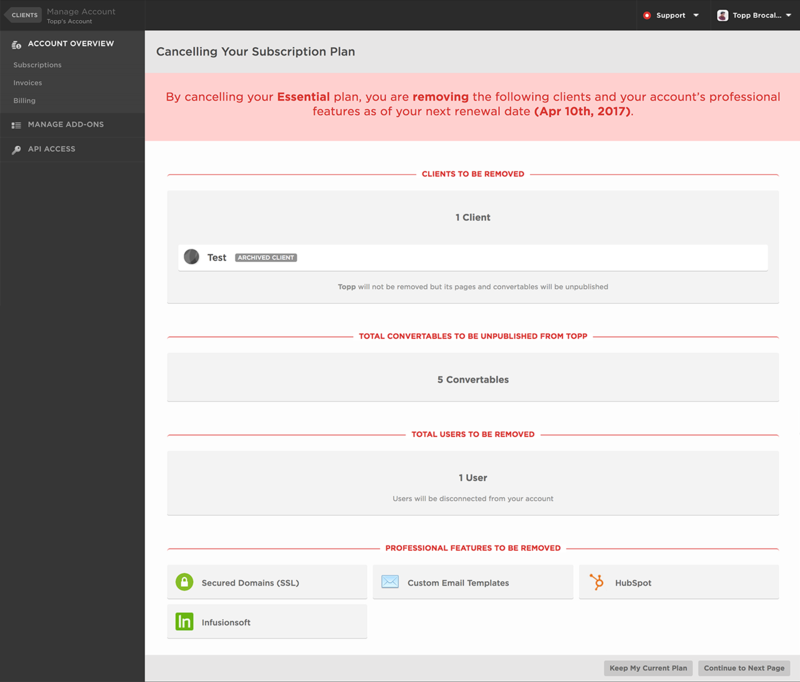 Cancellation means downgrading to a free plan in Unbounce. Users can still take advantage of the platform but with limited access to its features. Small resource investment given we get little ROI from downgrades and cancellation. The app doesn’t have any existing internal communication system for retention efforts. Working with mostly new team and limited platform services. I conducted an audit of the existing downgrade and cancellation flows. I then interviewed both internal stakeholders and customers who were at risk of churning. The information they provided painted a complete picture of the business and user requirements. Add-ons are essential as they allow expanded use of a feature, however, users are prompted to go to each add-on management screen to manually remove them from the account when downgrading or cancelling a plan. Knowing what the problem space was and identifying the needs of the business and users made it easier to update the downgrade and cancellation flows. 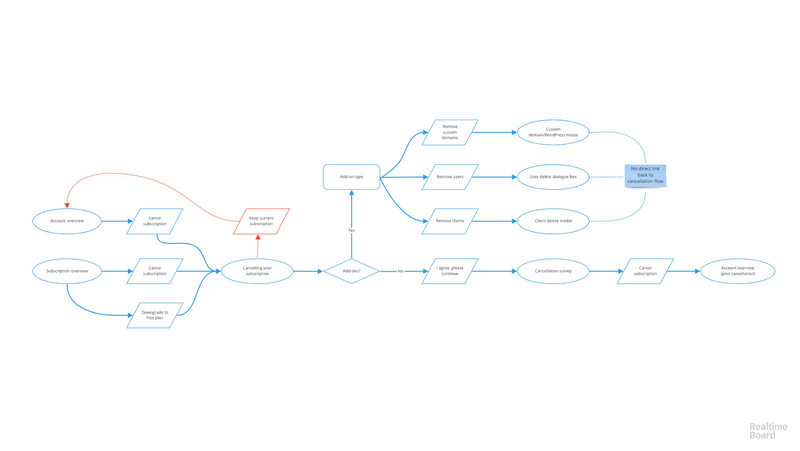 I updated the user flow and ran that against the existing system diagram that was produced by our lead developer. Downgrade and cancellation became a linear process with three different areas to opt-out of the flow. Add-ons are automatically removed on renewal date. The new downgrade process reduced the number of steps from 11 to 4 while cancellation from 14 to 4. Users don’t have to go out of their flow as removal of add-ons happens automatically. With the new platform, we are now able to push downgrades and cancellations to happen on renewal date as opposed to those events happening instantly. This is a plus for users since they get the most out of what they are paying for. Cancellation screen with new card UI pattern. I designed only one new screen since the new flows reduce steps to completion quite drastically. This screen summarizes what’s in their account including add-ons. It also informs the user that certain actions, like add-on removal, will happen on renewal date. While the downgrade or cancellation process is pending, Customer Success can launch retention campaigns to try to win them back. Less downgrade and cancellation related calls to the Customer Success team. Reduced number of users who bounce between plans due to retention campaigns. Introduced modular cards UI system — revamped account and plan overview pages. Successful attempt to embed a product designer and product manager to the development team as inspired by Spotify’s agile team framework. Shout out to Meagan, Partho, Philippe, Alex and Paolo. I learned so much, from release planning to systems design, while working with this amazing, talented crew. I hope we could get to work together again in the future!